Welcome to www.thecuecollector.com - the website all about antique billiards and snooker cues made in the United Kingdom, and the British Empire, during the period from 1870 to 1970.
www.thecuecollector.com traces the history of English billiards and snooker from the earliest Professional Championship matches in billiards; through the rise and fall of English billiards; to the end of an era that saw the disappearance of the leading English billiards firms in a series of mergers in the late 1960s. 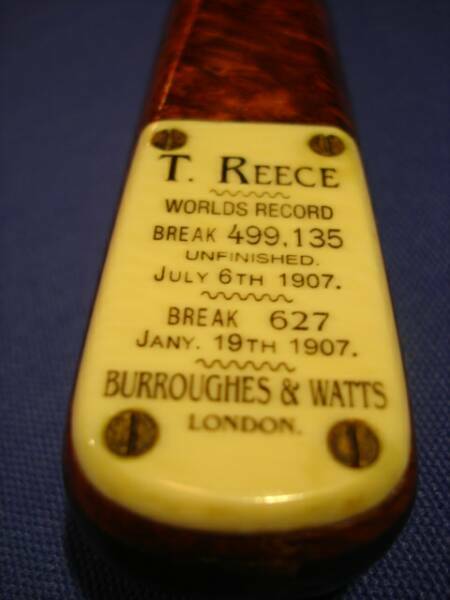 www.thecuecollector.com contains lots of information about antique English billiards and snooker cues, the billiards and snooker companies that made them and, most importantly, the players and their achievements. www.thecuecollector.com sets out to become the definitive reference point for the serious cue collector and also the beginner. It is designed to provide a broad range of information about antique billiards and snooker cues in an easily accessible format. It has been produced to meet the needs of cue collectors for a handy reference source. There are over 110 pages with pictures of antique billiards and snooker cues and information about the history associated with those cues. There are currently 70 different cues displayed on www.thecuecollector.com. Click on Take the Tour to casually browse through all 70 antique cues, in roughly chronological order - just click on Next Cue to progress. Cues by Name - lists all of the antique cues by name, in alphabetical order. Each page contains pictures of an antique billiards or snooker cue, together with some historical information about the antique cue. contains links to articles prepared especially for collectors of antique cues and others who have an interest in antique billiards and snooker cues. This section contains copies of the twenty "Cue Collector" articles that were published by the English Amateur Billiard Association in its magazine "The Amateur Billiard Player". These articles are a must read for the serious collector or any one else who is interested in antique cues. There are also a number of informative articles about weight stamps on antique cues, as well as articles about the different types of antique cue associated with various players. These articles will help you to identify and date antique cues.